The West is currently in the midst of an antiestablishment revolt of historic proportions. The Brexit vote in the United Kingdom, the election of Donald Trump in the United States, the rejection of Matteo Renzi’s neoliberal constitutional reform in Italy, the European Union’s unprecedented crisis of legitimation—although these interrelated phenomena differ in ideology and goals, they are all rejections of the (neo)liberal order that has dominated the world, and in particular the West, for the past thirty years. Even though the system has proven capable (for the most part) of absorbing and neutralizing these electoral uprisings, there is no indication that this antiestablishment revolt is going to abate any time soon.1 Support for antiestablishment parties in the developed world is at the highest level since the 1930s—and growing.2 At the same time, support for mainstream parties, including traditional social-democratic parties, has collapsed. The proximate causes of this backlash are rather obvious. The financial crisis of 2007–9 laid bare the scorched earth left behind by neoliberalism, which the elites had gone to great lengths to conceal both materially (through financialization) and ideologically (through appeals to “the end of history”). As credit dried up, it became apparent that for years the economy had continued to grow primarily because banks were distributing through debt the purchasing power that businesses were not providing in salaries. To paraphrase Warren Buffett, the receding tide of the debt-fueled boom revealed that most people were, in fact, swimming naked. The situation was and is further exacerbated by the post-crisis policies of fiscal austerity and wage deflation pursued by a number of Western governments, particularly in Europe. Governments saw the financial crisis as an opportunity to impose an even more radical neoliberal regime and push through policies designed to suit the financial sector and the wealthy at the expense of everyone else. Thus the unfinished agenda of privatization, deregulation, and welfare-state retrenchment, which had been temporarily interrupted by the financial crisis, was reinstated with even greater vigor. Amid growing popular dissatisfaction, social unrest, and mass unemployment in a number of European countries, political elites on both sides of the Atlantic responded with business-as-usual policies and discourses. As a result, the social contract binding citizens to traditional ruling parties is more strained today than at any other time since World War II—and in some countries has arguably already snapped. How should we explain the decline of the Left—not just the electoral decline of those parties that are commonly associated with the left side of the political spectrum, regardless of their effective political orientation, but also the decline of core left-wing values within those parties and within society generally? Why has the antiestablishment Left thus proven unable to fill the vacuum created by the collapse of the establishment Left? More generally, how did the Left come to count so little in global politics? Can the Left, both culturally and politically, return as a major force in our societies? And if so, how? The political Left has been making inroads in some countries in recent years. Notable examples include Bernie Sanders in the United States, the Podemos Party in Spain, and Jean-Luc Mélenchon in France, as well as Syriza’s successful rise to power in Greece (before it was rapidly brought to heel by the European establishment). Yet there is no denying that, for the most part, movements and parties of the extreme Right have been more effective than left-wing or progressive forces at tapping into the legitimate grievances of the masses disenfranchised, marginalized, impoverished, and dispossessed by the forty-year-long neoliberal class war waged from above. In particular, they are the only forces that have been able to provide a (more or less) coherent response to the widespread—and growing—yearning for greater territorial or national sovereignty. This demand is increasingly seen as the only way, in the absence of effective supranational mechanisms of representation, to regain some degree of collective control over politics and society and in particular over the flows of capital, trade, and people that constitute the essence of neoliberal globalization. Given neoliberalism’s war against sovereignty, it should come as no surprise that “sovereignty has become the master-frame of contemporary politics,” as Paolo Gerbaudo notes.4 After all, the hollowing out of national sovereignty and curtailment of popular-democratic mechanisms—what has been termed depoliticization—has been an essential element of the neoliberal project, aimed at insulating macroeconomic policies from popular contestation and removing any obstacles put in the way of economic exchanges and financial flows. Given the nefarious effects of depoliticization, it is only natural that the revolt against neoliberalism should first and foremost take the form of demands for a repoliticization of national decision-making processes. The fact that some visions of national sovereignty are defined along ethnic, exclusivist, and authoritarian lines should not be seen as an indictment of national sovereignty as such. History attests to the fact that national sovereignty and national self-determination are not intrinsically reactionary or jingoistic concepts—in fact, they were the rallying cries of countless nineteenth- and twentieth-century socialist and left-wing liberation movements. Even if we limit our analysis to core capitalist countries, it is apparent that virtually all the major social, economic, and political advancements of the past centuries were achieved through the institutions of the democratic nation-state, not through international, multilateral, or supranational institutions. Rather, global institutions have in many ways been used to roll back those very achievements, as we have seen in the context of the euro crisis, where supranational (and largely unaccountable) institutions such as the European Commission, Eurogroup, and European Central Bank used their power and authority to impose crippling austerity on struggling countries. The problem, in short, is not national sovereignty as such, but the fact that the concept in recent years has been largely abandoned to those who seek to push through a xenophobic and identitarian agenda. It would therefore be a grave mistake to explain away the seduction of the “Trumpenproletariat” by the Far Right as a case of false consciousness, as Marc Saxer notes.5 The working classes are simply turning to the only (so far) movements and parties that promise them some protection from the brutal currents of neoliberal globalization. Whether they can or truly intend to deliver on that promise is a different matter. However, this simply begs an even bigger question: why has the Left not been able to offer the working classes and increasingly proletarianized middle classes a credible alternative to neoliberalism and to neoliberal globalization? More to the point, why has it not been able to develop a progressive view of national sovereignty? As we argue in our upcoming book, Reclaiming the State: A Progressive Vision of Sovereignty for a Post-Neoliberal World (Pluto, September 2017), the reasons are numerous and overlapping. For starters, it is important to understand that the current existential crisis of the Left has very deep historical roots, reaching as far back as the 1960s. If we want to comprehend how the Left has gone astray, we must begin our analysis there. Today the postwar “Keynesian” era is eulogized by many on the left as a golden age in which organized labor and enlightened thinkers and policymakers (such as Keynes himself) were able to impose a “class compromise” on reluctant capitalists that delivered unprecedented levels of social progress—but which were subsequently rolled back following the so-called neoliberal counterrevolution. It is thus argued that, in order to overcome neoliberalism, all it takes is for enough members of the establishment to be swayed by an alternative set of ideas. However, the rise and fall of Keynesianism cannot simply be explained in terms of working-class strength or the victory of one ideology over another, but should instead be viewed as the outcome of the fortuitous confluence, in the aftermath of World War II, of a number of social, ideological, political, economic, technical, and institutional conditions. To fail to do so is to commit the same mistake that many leftists committed in the early postwar years. By failing to appreciate the extent to which the class compromise at the basis of the Fordist-Keynesian system was, in fact, a crucial component of that history-specific regime of accumulation, many socialists of the time convinced themselves “that they had done much more than they actually had to shift the balance of class power, and the relationship between states and markets.”6 Accordingly, they overlooked the fact that the capitalist class actively supported the class compromise only insofar as it was conducive to profit-making, and thus would jettison it once it ceased to be so. Some even argued that the developed world had already entered a postcapitalist phase, in which all the characteristic features of capitalism had been permanently eliminated, thanks to a fundamental shift of power in favor of labor vis-à-vis capital, and of the state vis-à-vis the market. Needless to say, that was not the case. Furthermore, monetarism—the ideological precursor to neoliberalism—had already started to percolate into left-wing policymaking circles as early as the late 1960s. In this sense, the dismantling of the postwar Keynesian framework cannot simply be explained as the victory of one ideology (“neoliberalism”) over another (“Keynesianism”), but should rather be understood as the result of a number of overlapping ideological, economic, and political factors: the capitalists’ response to the profit squeeze and to the political implications of full employment policies; the structural flaws of “actually existing Keynesianism”; and, importantly, the Left’s inability to offer a coherent response to the crisis of the Keynesian framework, let alone a radical alternative. Furthermore, throughout the 1970s and 1980s, a new (fallacious) Left consensus started to set in that economic and financial internationalization—what today we call “globalization”—had rendered the state increasingly powerless vis-à-vis “the forces of the market.” Therefore, the reasoning went, countries had little choice but to abandon national economic strategies and all the traditional instruments of intervention in the economy—such as tariffs and other trade barriers, capital controls, currency and exchange rate manipulation, and fiscal and central bank policies. Instead they could only hope, at best, for transnational or supranational forms of economic governance. In other words, government intervention in the economy came to be seen not only as ineffective but, increasingly, as outright impossible. This process—which was generally (and erroneously) framed as a shift from the state to the market—was accompanied by a ferocious attack on the very idea of national sovereignty, increasingly vilified as a relic of the past. As we argue in Reclaiming the State, the Left—in particular the European Left—played a crucial role in this regard as well, by cementing this ideological shift towards a postnational and post-sovereign view of the world, often anticipating the Right on these issues. The repercussions of Mitterrand’s about-face are still being felt today. It is often held out by left-wing and progressive intellectuals as proof of the fact that globalization and the internationalization of finance has ended the era of nation-states and their capacity to pursue policies that are not in accord with the diktats of global capital. The claim is that if a government tries to autonomously pursue full employment and a progressive/redistributive agenda, it will inevitably be punished by the amorphous forces of global capital. This narrative claims that Mitterrand had no option but to abandon his agenda of radical reform. To most modern-day leftists, Mitterrand thus represents a pragmatist who was cognizant of the international capitalist forces he was up against and responsible enough to do what was best for France. In fact, sovereign, currency-issuing states—such as France in the 1980s—far from being helpless against the power of global capital, still have the capacity to deliver full employment and social justice to their citizens. So how did the idea of the “death of the state” come to be so ingrained in our collective consciousness? Underlying this postnational view of the world was (is) a failure of left-wing intellectuals and policymakers to understand—and in some cases an explicit attempt to conceal—that “globalization” was (is) not the result of inexorable economic and technological changes but was (is) largely the product of state-driven processes. All the elements that we associate with neoliberal globalization—delocalization, deindustrialization, the free movement of goods and capital, etc.—were (are), in most cases, the result of choices made by governments. More generally, states continue to play a crucial role in promoting, enforcing, and sustaining a neoliberal international framework (though that appears to be changing) as well as establishing the domestic conditions for allowing global accumulation to flourish. It is self-evident, after all, that the process of neoliberalization would not have been possible if governments—and in particular social democratic governments—had not resorted to a wide array of tools to promote it: the liberalization of goods and capital markets; the privatization of resources and social services; the deregulation of business, and financial markets in particular; the reduction of workers’ rights (first and foremost, the right to collective bargaining) and more generally, the repression of labor activism; the lowering of taxes on wealth and capital, at the expense of the middle and working classes; the slashing of social programs, and so on. These policies were systemically pursued throughout the West (and imposed on developing countries) with unprecedented determination, and with the support of all the major international institutions and political parties. Even the loss of national sovereignty which has been invoked in the past, and which continues to be invoked today, to justify neoliberal policies is largely the result of a willing and conscious limitation of state sovereign rights by national elites. The various policies adopted by Western governments to this end include: (1) reducing the power of parliaments vis-à-vis that of executive bureaucracies; (2) making central banks formally independent of governments, with the explicit aim of subjugating the latter to “market-based discipline”; (3) adopting “inflation targeting” as the dominant approach to central bank policymaking—an approach which stresses low inflation as the primary objective of monetary policy, to the exclusion of other policy objectives, such as full employment; (4) adopting rules-bound policies—on public spending, debt as a proportion of GDP, competition, etc.—thereby limiting what politicians can do at the behest of their electorates; (5) subordinating spending departments to the control of treasuries; (6) readopting fixed exchange rate systems, which severely limit the ability of governments to exercise control over economic policy; and, perhaps most important, (7) surrendering national prerogatives to supranational institutions and super-state bureaucracies such as the European Union. The reason why governments chose to willingly “tie their hands” is all too clear: as the European case epitomizes, the creation of self-imposed “external constraints” allowed national politicians to reduce the political costs of the neoliberal transition—which clearly involved unpopular policies—by “scapegoating” institutionalized rules and “independent” or international institutions, which in turn were presented as an inevitable outcome of the new, harsh realities of globalization. Moreover, neoliberalism has been (and is) associated with various forms of authoritarian statism—that is, the opposite of the minimal state advocated by neoliberals—as states have bolstered their security and policing arms as part of a generalized militarization of civil protest. In other words, not only does neoliberal economic policy require the presence of a strong state, but it requires the presence of an authoritarian state at both the domestic and international levels, particularly where extreme forms of neoliberalism are concerned, such as the ones experimented with in periphery countries. In this sense, neoliberal ideology, at least in its official anti-state guise, should be considered little more than a convenient alibi for what has been and is essentially a political and state-driven project. Capital remains as dependent on the state today as it did under “Keynesianism”—to police the working classes, bail out large firms that would otherwise go bankrupt, open up markets abroad (including through military intervention), etc. The ultimate irony, or indecency, is that traditional Left establishment parties have themselves become standard bearers for neoliberalism, both while in elected office and in opposition. In the months and years following the financial crash of 2007–9, capital’s—and capitalism’s—continued dependency on the state in the age of neoliberalism became glaringly obvious, as the governments of the United States, Europe, and elsewhere bailed out their respective financial institutions to the tune of trillions of dollars. Yet there were no cries from mainstream pundits at the time questioning “Where is the money coming from?” Soon, however, those same individuals, some of whom were direct beneficiaries of the bailout packages, were back on song, lecturing us that our governments were bankrupt, that our grandchildren would be crushed by rising public debt burdens, and that hyperinflation was imminent. Nonetheless, the erroneous idea of the waning nation-state has become an entrenched fixture of the Left. We consider this view to be central in understanding the decline of the traditional political Left and its acquiescence to neoliberalism. In view of the above, it is hardly surprising that the mainstream Left is, today, utterly incapable of offering a positive vision of national sovereignty in response to neoliberal globalization. To make matters worse, most leftists have bought into the macroeconomic myths that the establishment uses to discourage any alternative use of state fiscal capacities. For example, they have accepted without question the so-called household budget analogy, which suggests that currency-issuing governments, like households, are financially constrained, and that fiscal deficits impose crippling debt burdens on future generations. This has gone hand in hand with another, equally tragic, development. Following its historical defeat, the Left’s traditional anticapitalist focus on class slowly gave way to a liberal-individualist understanding of emancipation. Waylaid by postmodernist and poststructuralist theories, Left intellectuals slowly abandoned Marxian class categories to focus instead on elements of political power and the use of language and narratives as a way of establishing meaning. This shift also defined new arenas of political struggle that were diametrically opposed to those defined by Marx. Over the past three decades, the Left’s focus on “capitalism” has given way to a focus on issues such as racism, gender, homophobia, multiculturalism, etc. Marginality is no longer described in terms of class but rather in terms of identity. The struggle against the illegitimate hegemony of the capitalist class has given way to the struggles of a variety of (more or less) oppressed and marginalized groups and minorities: women, blacks, LGBTQs, etc. As a result, class struggle has ceased to be seen as the path to liberation. In this new postmodernist world, only categories that transcend class boundaries are considered meaningful. Moreover, the institutions that evolved to defend workers against capital—such as trade unions and social democratic political parties—have become subjugated to these non–class struggle foci. What has emerged in practically all Western countries as a result, as Nancy Fraser notes, is a perverse political alignment between “mainstream currents of new social movements (feminism, anti-racism, multiculturalism, and LGBTQ rights), on the one side, and high-end ‘symbolic’ and service-based business sectors (Wall Street, Silicon Valley, and Hollywood), on the other.”12 The result is a progressive neoliberalism “that mixe[s] together truncated ideals of emancipation and lethal forms of financialization,” with the former unwittingly lending their charisma to the latter. As societies have become increasingly divided between well-educated, highly mobile, highly skilled, socially progressive cosmopolitan urbanites, and lower skilled and less educated peripherals who rarely work abroad and face competition from immigrants, the mainstream Left has tended to consistently side with the former. Indeed, the split between the working classes and the intellectual-cultural Left can be considered one of the main reasons behind the right-wing revolt currently engulfing the West. As Jonathan Haidt has argued, the way the globalist urban elites talk and act unwittingly activates authoritarian tendencies in a subset of nationalists.13 In a vicious feedback loop, however, the more the working classes turn to right-wing populism and nationalism, the more the intellectual-cultural Left doubles down on its liberal-cosmopolitan fantasies, further radicalizing the ethnonationalism of the proletariat. This is particularly evident in the European debate, where, despite the disastrous effects of the EU and monetary union, the mainstream Left—often appealing to exactly the same arguments used by Callaghan and Mitterrand more than a generation ago—continues to cling to these institutions. Despite all evidence to the contrary, the mainstream Left asserts that these institutions can be reformed in a progressive direction, and dismisses any talk of restoring a progressive agenda on the foundation of retrieved national sovereignty as a “retreat into nationalist positions,” inevitably bound to plunge the continent into 1930s-style fascism.14 This position, as irrational as it may be, is not surprising, considering that the European Monetary Union is, after all, a brainchild of the European Left. However, such a position presents numerous problems, which are ultimately rooted in a failure to understand the true nature of the EU and monetary union. First of all, it ignores that the EU’s economic and political constitution is structured to produce the results that we are seeing: the erosion of popular sovereignty, the massive transfer of wealth from the middle and lower classes to the upper classes, the weakening of labor and more generally the rollback of the democratic and socioeconomic gains that had previously been achieved by subordinate classes. The EU is designed precisely to impede the kind of radical reforms to which progressive integrationists or federalists aspire. More importantly, however, this position effectively reduces the Left to the role of defender of the status quo, thus allowing the political Right to monopolize citizens’ legitimate anti-systemic and specifically anti-EU grievances. This approach is tantamount to relinquishing the discursive and political battleground for a post-neoliberal hegemony—which is inextricably linked to the question of national sovereignty—to the Right and extreme Right. It is not hard to see that if progressive change can only be implemented at the global or European level—in other words, if the alternative to the status quo offered to electorates is one between reactionary nationalism and progressive globalism—then the Left has already lost the battle. (1) A correct understanding of the capacities of monetarily sovereign (or currency-issuing) governments, and more specifically an understanding that such governments are never revenue- or solvency-constrained, because they issue their own currency by legislative fiat and therefore can never “run out of money” or become insolvent. These governments always have an unlimited capacity to spend in their own currencies: that is, they can purchase whatever they like, as long as there are goods and services for sale in the currency they issue, and can use their money-creating powers to underwrite massive investment in physical and social infrastructure. At the very least, they can purchase all idle labor and put it back to productive use (for example, through a job guarantee). This, of course, does not apply to countries that are part of the European Monetary Union. Understanding the operational reality of modern fiat economies is therefore a conditio sine qua non for envisioning a progressive, emancipatory vision of national sovereignty. (2) A drastic expansion of the state’s role—and an equally drastic downsizing of the private sector’s role—in the investment, production, and distribution system. A progressive agenda for the twenty-first century must thus necessarily include a broad renationalization of key sectors of the economy—including, and most importantly, the financial sector—and a new and updated notion of planning, aimed at placing the commanding heights of economic policy under democratic control. We consider this to be an equally necessary condition for the pursuit of a progressive agenda and in particular for the socioecological transformation of production and society that is desperately needed to deal with the ongoing and worsening environmental crisis. These two elements, in our opinion, provide the foundations on which to build a radical and progressive alternative to neoliberalism, the specific details of which should be the outcome of a broad debate among progressive thinkers, social movements, and political parties in each country and at the international level. Finally, it is clear that having a compelling socioeconomic program is not enough to win over the hearts and minds of the people. Beyond the centrality of the state from a political-economic point of view, the Left has to come to terms with the fact that for the vast majority of people that do not belong—and never will belong—to the globe-trotting international elite, their sense of citizenship, collective identity, and common good is intrinsically and intimately tied to nationhood. Ultimately, being a citizen means to deliberate with other citizens in a shared political community and hold decision-makers accountable. The Right today is winning also because it is capable of weaving powerful narratives of collective identity in which national sovereignty is defined in nativist or even racist terms. Progressives must thus be able to provide equally powerful narratives and myths, which recognize the human need for belonging and connectedness. In this sense, a progressive vision of national sovereignty should aim to reconstruct and redefine the national state as a place where citizens can seek refuge “in democratic protection, popular rule, local autonomy, collective goods, and egalitarian traditions” rather than in a culturally and ethnically homogenized society, as Wolfgang Streeck argues.18 This is also the necessary prerequisite for the construction of a new international order, based on interdependent but independent sovereign states. 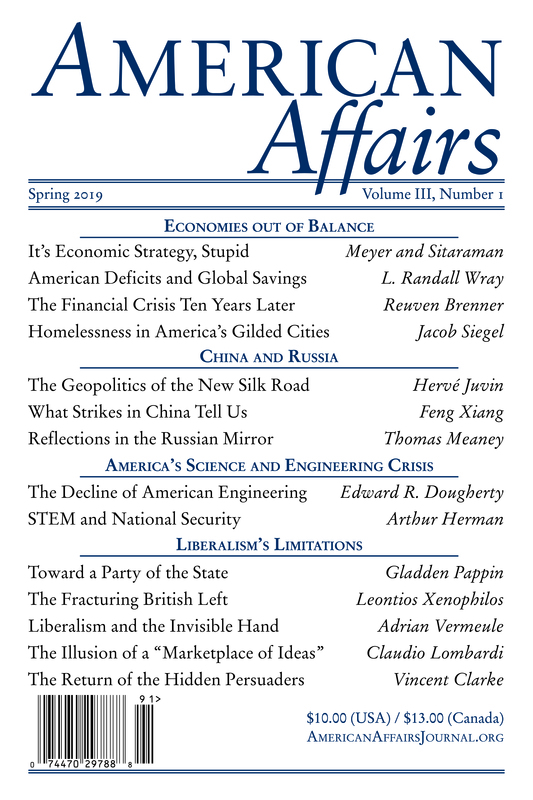 This article originally appeared in American Affairs Volume I, Number 3 (Fall 2017): 75–91. 1 See Perry Anderson, “Why the System Will Still Win,” Le Monde diplomatique, March 2017. 2 Ray Dalio et al., Populism: The Phenomenon, Bridgewater, March 22, 2017. 3 “Rose Thou Art Sick,” Economist, April 2, 2016. 4 Paolo Gerbaudo, “Post-Neoliberalism and the Politics of Sovereignty,” openDemocracy, November 4, 2016. 5 Marc Saxer, “In Search of a Progressive Patriotism,” Medium, April 15, 2017. 6 Adaner Usmani, “The Left in Europe: From Social Democracy to the Crisis in the Euro Zone: An Interview with Leo Panitch,” New Politics 14, no. 54 (Winter 2013), http://newpol.org/content/left-europe-social-democracy-crisis-euro-zone-interview-leo-panitch. 7 Stuart Hall, “The Great Moving Right Show,” Marxism Today (January 1979): 18. 8 Colin Hay, “Globalisation, Welfare Retrenchment and ‘the Logic of No Alternative’: Why Second-Best Won’t Do,” Journal of Social Policy 27, no. 4 (October 1998): 529. 9 John Ardagh, France in the New Century: Portrait of a Changing Society (London: Penguin, 2000), 687–88. 10 Stephen Gill, “The Geopolitics of Global Organic Crisis,” Analyze Greece!, June 5, 2015, http://www.analyzegreece.gr/topics/greece-europe/item/231-stephen-gill-the-geopolitics-of-global-organic-crisis. 11 Richard Peet, “Contradictions of Finance Capitalism,” Monthly Review 63, no. 7 (December 2011), https://monthlyreview.org/2011/12/01/contradictions-of-finance-capitalism/. 12 Nancy Fraser, “The End of Progressive Neoliberalism,” Dissent, January 2, 2017, https://www.dissentmagazine.org/online_articles/progressive-neoliberalism-reactionary-populism-nancy-fraser. 13 Jonathan Haidt, “When and Why Nationalism Beats Globalism,” American Interest 12, no. 1 (July 2016), https://www.the-american-interest.com/2016/07/10/when-and-why-nationalism-beats-globalism/. 14 Yanis Varoufakis and Lorenzo Marsili, “Varoufakis: ‘A un anno dall’Oxi, non rifugiamoci nei nazionalismi. Un’Europa democratica è possibile,’” La Repubblica, July 8, 2016, http://www.repubblica.it/esteri/2016/07/08/news/varoufakis_a_un_anno_dall_oxi_non_rifugiamoci_nei_nazionalismi_un_ europa_democratica_e_possibile_-143703316/. 15 J. W. Mason, “A Cautious Case for Economic Nationalism,” Dissent (Spring 2017), https://www.dissentmagazine.org/article/cautious-case-economic-nationalism-global-capitalism. 18 Wolfgang Streeck et al., “Where Are We Now? Responses to the Referendum,” London Review of Books 38, no. 14 (July 14, 2016), https://www.lrb.co.uk/v38/n14/on-brexit/where-are-we-now. William Mitchell is the chair in economics at the University of Newcastle, Australia, and a visiting professor at Maastricht University, the Netherlands. He is the author of Eurozone Dystopia (Edward Elgar, 2015) and coauthor of Reclaiming the State (Pluto, 2017). Thomas Fazi is the author of The Battle for Europe (Pluto, 2014) and coauthor of Reclaiming the State (Pluto, 2017).